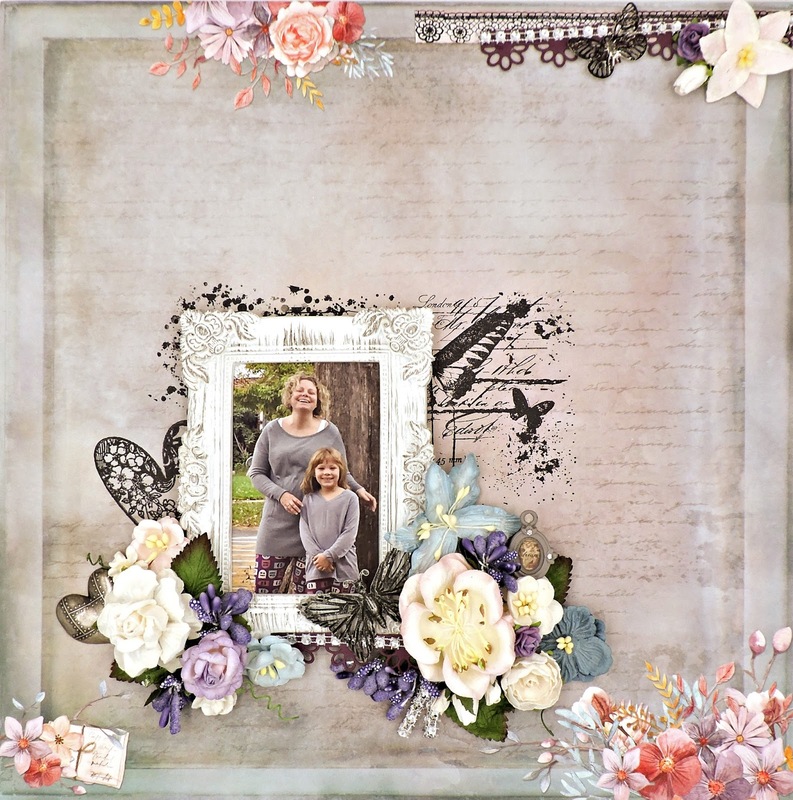 When I unpacked the November Market Street kit from Swirlydoos, I instantly knew that I'd be scrapping this mother/daughter photo of my beautiful DIL and my look-alike granddaughter, complete with matching outfits, that I took several weeks ago. Not only were the colors and patterns absolutely perfect, but the included (and incredible!) sketch by Swirly DT Coordinator Kim Heard is just the road map that I needed! The kit itself is packed full of gorgeous papers and embellishments from 49 and Market's Heirloom Botanicals collects, along with coordinating papers from Kaisercraft and Bo Bunny, trinkets from Prima and a huge roll of Darice bling. First, I die cut a couple of strips of Concord cardstock from the March kit with the Kaisercraft Lacy Borders die. After measuring them to size, I glued on single strips that I cut from the Darice bling roll. I've used flowers from the Main Kit as well as the Flower Add-On along with some blooms and berries from my stash. Here and there, I've tucked in some more of the bling, one of the pretty Prima trinkets and some metal pieces - a heart and several butterflies. The borders strip on top is actually a bit of the title strip from the bottom of the paper, given a pattern to match the die cut with yet another Prima stamp. Thanks so much for looking: I truly appreciate your visits... And thanks, Kim, for your wonderful inspiration!!!!! !